It had been billed as a triple celebration; The Royal Wedding, Clive & Tricia’s 40th Wedding Anniversary and their company; SES Autoparts 20th Anniversary. Some 66 guests attended the event at Fontwell park which as well as being a triple celebration had been organised as a fundraiser to celebrate the life of Lisa Wilson. 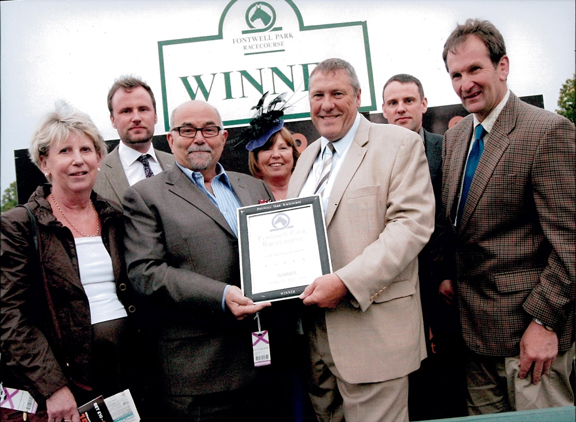 With everyone in great spirits following the Royal Wedding earlier that day, the main event on the race card was ‘The Lisa Wilson Scholarship Fund’ handicap chase. Over 5,000 were attending Fontwell where there was a raffle, a bucket collection, a silent auction and the main auction took part in the main restaurant and collectively raised in excess of £7,000. Clive Wilson spoke about the charity in the marquee and in the main restaurant before the auction as well as being interviewed by Channel 4’s Derek Thompson for the television. 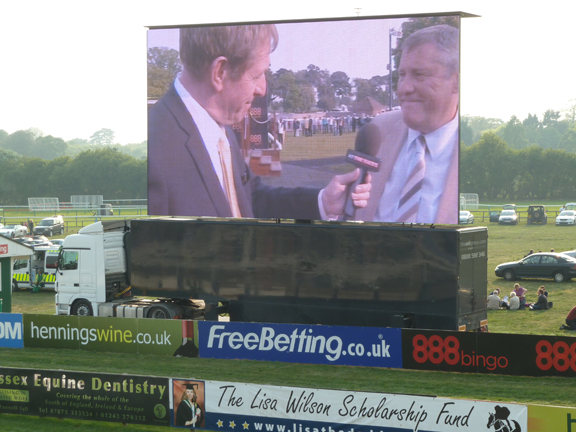 Clive Wilson being interviewed by Derek Thompson from Channel 4 on the big screen at Fontwell Park. The auction consisted of some fantastic prizes that had been provided by people from the horse racing world, some major worldwide celebrities and friends who contributed holidays; Channel 4 put up a day at the races, Mick Channon had put up a day to his stables at West Isley, and the famous Godolphin stables had donated a set of silks signed by Frankie Dettori and Ahmed Ajtebi. Jenson Button had donated a signed cap and picture which were framed, and the World’s Number 1 female recording artist, Celine Dion, had donated a personally signed photograph. On top of this Clive’s and Tricia’s friends, Paul and Ross Tomlinson, donated a holiday in Florida which sold for over £1,000, Nigel and Fiona Morgan donated a week in their holiday home in Switzerland, and Steve and Shirley Thomas donated a week at their holiday home in Cyprus. Following the horse racing there was a Take That tribute band, and the evening finished with a bang with a spectacular firework display. The event was a huge success and was thoroughly enjoyed by everybody. Thank you all for your most generous support.